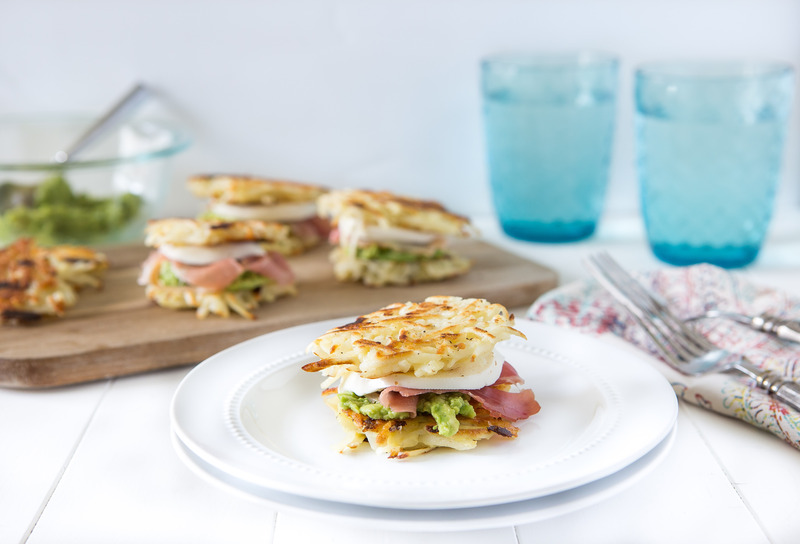 These Hash Brown Stacks are courtesy of A Zesty Bite as part of the U.S. Potato Board’s Potato Lovers Club program. In a large bowl add hash browns, egg, shredded cheese, pepper and salt. Mix the mixture using your hands, making sure everything is well coated. Add a teaspoon of olive oil to a large non-stick sauté pan over low to medium heat. Grab a handful of the potato mixture, about ¼ cup, and create a ball. Place it down on the pan and carefully pat it down to create a flat disc shape. Cook for 3 to 4 minutes and then flip for an additional 3 to 4 minutes. Repeat until all hash browns have been used. In a small bowl, mash the avocados and sprinkle with a little garlic salt. Place a spoonful of the mixture onto a hash brown stack. Top with half slice of Serrano ham and a slice of mozzarella cheese. Top it with another hash brown stack.